I have consumed a large amount of hot chocolate this winter. I love a cup of hot cocoa about 8 o’clock at night. It’s comfort food for me. When I take my first sip, I want to taste chocolate rather than sugar. 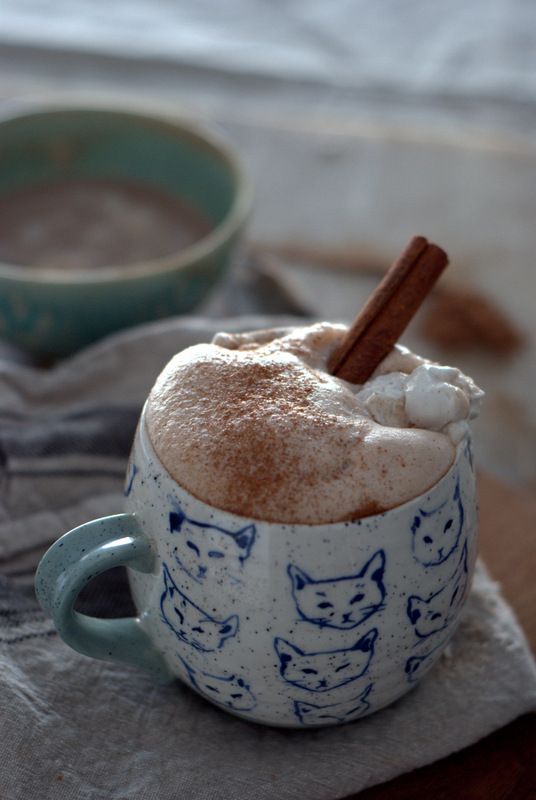 Most hot chocolate mixes are cloyingly sweet to my taste. I’m perfectly content drinking my hot chocolate using unsweetened cocoa and a blend of homemade Coconut Almond Milk. It’s so delicous. My tastes vary from year to year. This past winter I had a few colds so I found myself adding a dash of cayenne pepper to my hot chocolate to relieve congestion. I became addicted to the subtle burn. 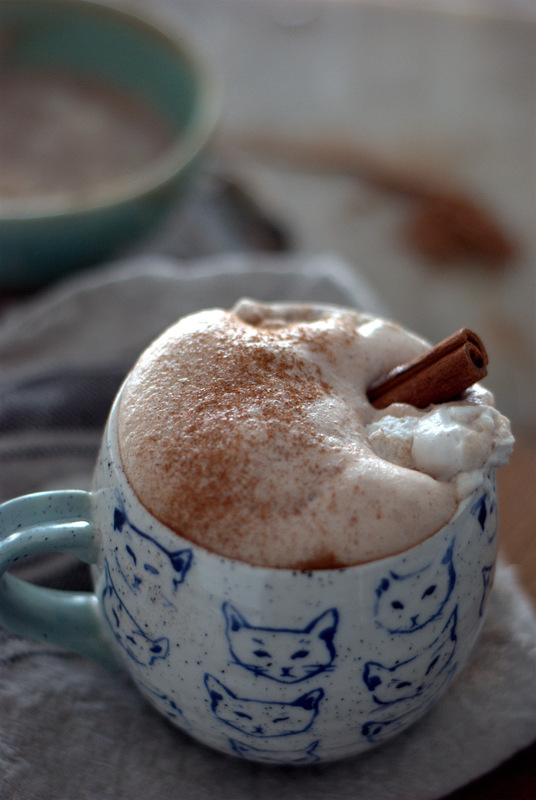 I began adding a few dashes of cinnamon, which created a perfect soothing drink. I love dark chocolate so much. I can’t live without it. I have a cupboard where I keep my chocolate and there are times when I just open the cupboard and inhale. Ahhhh the smell is all I need to perk me up. My second love: kitties. Chocolate and kitties. My idea of a fabulous Friday night is watching a good movie with a cup of cocoa and a cat snuggled on my lap. It’s the best. THE BEST. This really isn’t much of a recipe. It’s based upon my likes and taste. Feel free to adjust the spices according to your taste. This recipe makes one serving. My serving. My husband prefers Nesquick. Ugh! I won’t go there. In a small saucepan or milk frother, add 1 cup coconut almond milk and 1 tablespoon raw cacao. Feel free to add or decrease the amount. 1/2 teaspoon raw Maca powder, which has an amazing malt like flavor. I add it to my hot chocolate and smoothies daily. It tastes delicious and has great health benefits. It’s quite energizing. Add a dash or two of ground cinnamon. A good pinch of cayenne pepper. If you have sinus congestion, add two pinches. I add only a bit of sweetener. No more than 1/2 a teaspoon of pure maple sugar. You can use your favorite sweetener just as long as it isn’t aspartame. I hate that stuff. Whisk the ingredients and heat. You will notice that the cacao really doesn’t mix well in cold milk. Once the milk heats up, it will blend in nicely. Pour into your favorite cocoa cup. This is my favorite cocoa mug. So cute. 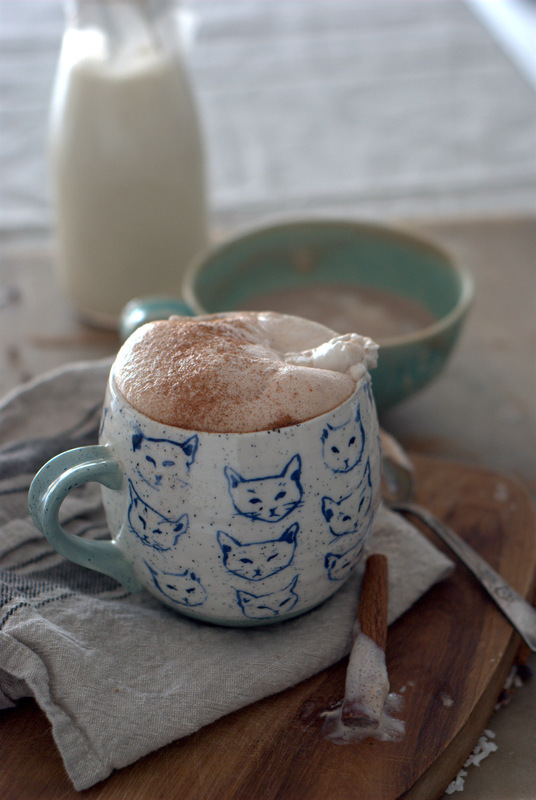 If I want a richer hot chocolate, I will add a dollop of whipped coconut cream. It’s so creamy and rich. You could add a dairy whipped cream as well, which is equally delicious, but no longer dairy free or Vegan. At this moment my cinnamon stick began to sink into the cup. It slowly disappeared. I wish I would have captured the event on camera, but instead I tried to save the cinnamon stick. I was too late. 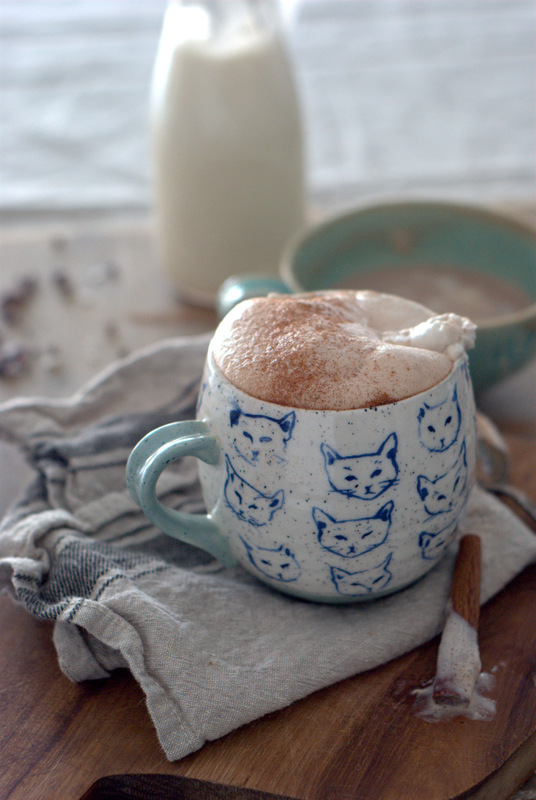 Don't let a dairy allergy keep you away from decadent hot chocolate. Make your own with these warming spices. Heat all of the ingredients in a small saucepan. Whisk until smooth. Serve at your favorite temperature. Simply envision getting a charge out of chocolate without blame, for all intents and purposes no calories, no fat or starches, no caffeine, no gluten, no dairy, no Trans-fats, no corn syrup, no sodium, no sugar and no soy. I will spare the logical information for different articles and for the time being simply adhere to the essentials. I don't like Nesquick too. It always tastes off to me. 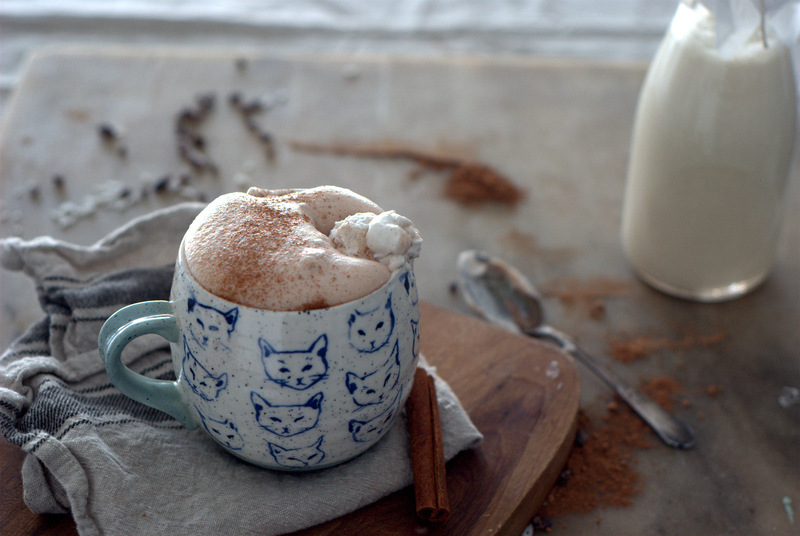 Your hot chocolate looks marvelous, though. I could drink that even in summer. And love the cat mugs too. Yes, the cat mugs are the best. I love them. Thanks for your kind comment. Looks so yummy. Think i will make a cup this morning! Thank you so much for your comment. This is good hot chocolate, but it cannot compare to French chocolat chaud. Your english is great. So much better than my French.